You probably know what the Kia Soul is. It’s that cute boxy car with the head-thumping hamsters and lit up speakers. But who is Hense? Hense is an Atlanta born graffiti artist who created a Soul featuring Cartoon Network’s Adult Swim Aqua Teen Hunger Force. 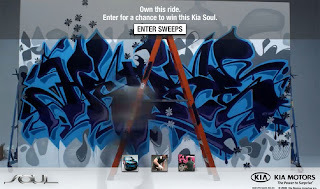 It’s a nice product integration with a show that reaches Kia Soul’s target, hip 20-30 something consumers who see themselves as hip. Hense appeals to that same target in a way that is authentic, plus the car actually works as a rolling piece of graffiti; though, maybe it doesn't work if an un-hip 37 year old like myself likes the look of the finished product. Today marks the start of the contest. A simple button to enter the sweepstakes was added to the promotion site, that launched in early May, showing what the contest is about and what inspired the artist. Don’t think the contest entry form forgot about the hip audience. You actually have to check a box saying you “agree with all [of Hyundai’s] draining legal speak.” Dude. And like a lot of contests lately, you can re-enter the contest everyday until June 28. Sure, the company already has your information and if you check the right boxes, can market you into oblivion, but they want people to reengage by getting people to keep coming back to think Kia Soul. You can keep coming back and everyday you’ll remember that hip Hense designed Soul that you could win and, if you don’t, hopefully you’ll buy one sans graffiti.